On The Australian TV show The Gruen Transfer, there is a segment of the show called The Pitch in which ad agencies compete to win a specific campaign. Each campaign is suggested by viewers, and are often fantastical and humorous, but never dull. 'The Gruen Transfer' is named after "Victor Gruen, the guy who designed the very first shopping mall. The term describes that split second when the mall's intentionally confusing layout makes our eyes glaze and our jaws slacken... the moment when we forget what we came for and become impulse buyers." And such is the idea behind 'The Pitch.' Can advertising be successful in selling us on ideas that are essentially un-sellable, such as bottled air, a ban on swearing, or moving the country's capital to a new location? The below pitch requires the competing agencies to sell consumers on the idea of abandoning religion altogether. It's interesting that this particular pitch is something that we have seen in reality (although not on any mass scale, and certainly not on national television) via organizations such as the Center For Inquiry and the British Humanist Association. I'm not certain that this particular pitch is quite as fantastical as bottled air. There is a strange phenomenon occurring in conservative circles. It's a growing chorus of resentment towards the recipients of welfare (I've touched upon this phenomenon recently). This resentment is characterized by the assumption that welfare recipients are lazy, good-for-nothing, baby-having, divorced, drug and alcohol-abusing, freeloading minorities who are gaming the system (like raccoons). 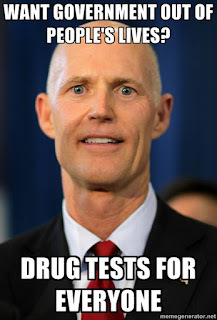 There is growing applause for Florida Governor Rick Scott's welfare drug-screen measure, which requires that applicants pass a drug test prior to receiving welfare. 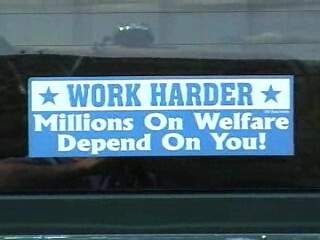 The eradication of welfare entirely is a common rallying cry for Libertarians and the Tea Party. One of the most disturbing elements of this resentment is that so much of it seems to be coming from people who identify as Christians. While it is difficult to know what Jesus would say about government welfare assistance, we can assume that he would frown upon his followers' insistence that we turn our backs on "the least of these." I'm no theologian, but Matthew 25:34-36, Mark 10:21-22, Mark 12:41-44, Luke 14:12-14, and Luke 12:16-21 seem pretty clear on what Jesus might have thought about welfare, if he had lived in an age when societies are as vast and complex as they are today, and when the kindness of strangers on the roadside is not a scalable solution. The chorus being sung by so many self-proclaimed Christians is drowning out the cries from atheists and humanists who can't believe what they're hearing from the faithful. I am not claiming that there are no non-believers who also call for welfare drug testing, or the end of welfare (or that there are not many charitable Christians who denounce such thinking), but I am saying that a plurality of non-theists and humanists adhere to a secular moral code that can in no way justify this thinking -- thinking that is clearly not in any way aligned with Christianity. In my many discussions with people of faith who hold these anti-welfare/pro-drug screening views, nearly all of them relay anecdotes (often secondhand) that perpetuate the above characterizations of welfare recipients. These anecdotes are broadcast by talk show hosts, pundits, politicians, columnists, bloggers, and anyone with a Facebook account. These anecdotes help to paint a picture, but the picture is for the most part, pure fantasy. 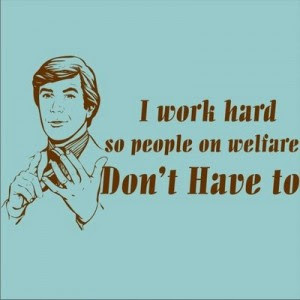 To be fair, nobody is denying that there are documented instances of welfare abuse. You will find some level of abuse in any system that distributes goods and services. What is unforgivable, however, is the gross mis-characterization of welfare recipients, and the charges that have been leveled against them, by so many Americans, many of them religious. Let's take a look at the myths. "Since few substance abusers are identified in tests, but many are tested, the cost of catching a drug abuser may run between $20,000 and $77,000 per person." "In another study, drug use was as prevalent among employed TANF recipients as among the unemployed. This is also true of the general population, as most drug users have full‐time employment." 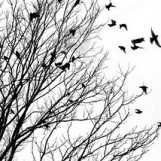 "No study has shown that denying assistance facilitates substance abuse treatment. On the contrary, the most effective drug treatment programs show that TANF recipients require additional support. Transportation, housing and child care support help parents overcome barriers to successful program completion. Denying access to benefits will increase barriers to economic advancement and family well‐being." "In 1996, the National Institute of Alcohol Abuse and Alcoholism found that “proportions of welfare recipients using, abusing, or dependent on alcohol or illicit drugs are consistent with proportions of both the adult U.S. population and adults who do not receive welfare. Furthermore, Michigan, the only state to have imposed random drug testing on TANF beneficiaries, found that only 10 percent of recipients tested positive for illicit drugs, with 3 percent testing positive for “hard” drugs, such as cocaine. These rates are consistent with its general population. While other studies show that TANF recipients are somewhat more likely to have tried illicit drugs or have substance abuse disorders than the general population, the fact remains that a large majority of recipients do not use drugs." I know that none of the above provides a solution to the problem of a small number of people gaming the system, but I believe it illustrates that there are a lot of myths and misunderstandings about welfare recipients that have been fueled by the media, by our own stereotypes, and anecdotes we hear, and do no reflect reality. Since Gov. 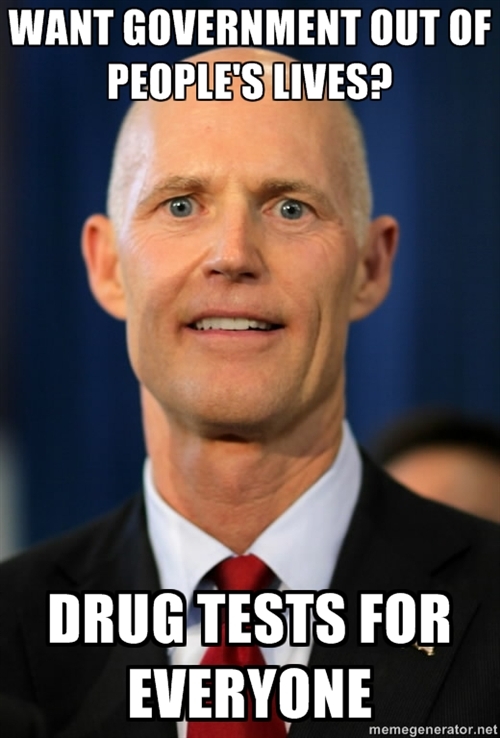 Scott's welfare drug-screening program began in July, only 2% of those screened have tested positive. Two. Percent. Cost of the tests averages about $30. Assuming that 1,000 to 1,500 applicants take the test every month, the state will owe about $28,800-$43,200 monthly in reimbursements to those who test drug-free. That compares with roughly $32,200-$48,200 the state may save on one month’s worth of rejected applicants. Net savings to the state: $3,400 to $5,000 annually on one month’s worth of rejected applicants. Over 12 months, the money saved on all rejected applicants would add up to $40,800 to $60,000 for a program that state analysts have predicted will cost $178 million this fiscal year. God-fearing patriotic Americans have simply had it with these mostly white, working, married, adult US citizens, who need temporary assistance with basic needs until they can through a difficult time. They're so pissed off about it, they're willing to fork over an additional $178 million so that they can ensure that their money is not going to 2% of them. These people want a smaller government that spends less. They want government out of their lives. And to accomplish this they want to pay the government hundreds of millions of dollars to collect Americans' urine in a cup. In 2009, a California man was arrested outside a Yolo County market with a $3.99 bag of Tillamook shredded cheese in his pants he had not paid for. Due to California's three strikes law, the judge sentenced him to seven years and eight months in jail. It costs taxpayers between $50,000 and $100,000 a year to keep a man imprisoned. No matter what you think of Richard Dawkins, he has an extraordinary gift for explaining science's complexities in a way that anyone can easily understand. I credit him, along with Jerry Coyne, David Sloane Wilson, and others, with helping me (an English major who did never had much interest in science, and who can't recall hearing about evolution in school) to really grasp the complexity and beauty of evolution. 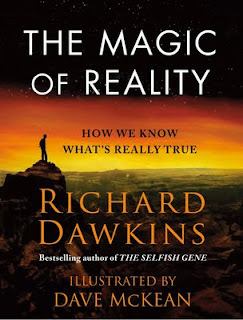 After several wonderful books written for adults, including The Selfish Gene, The Greatest Show on Earth, and The Ancestor's Tale, Dawkins has undertaken the task of writing a sprawling, 272-page, illustrated science book for all ages. 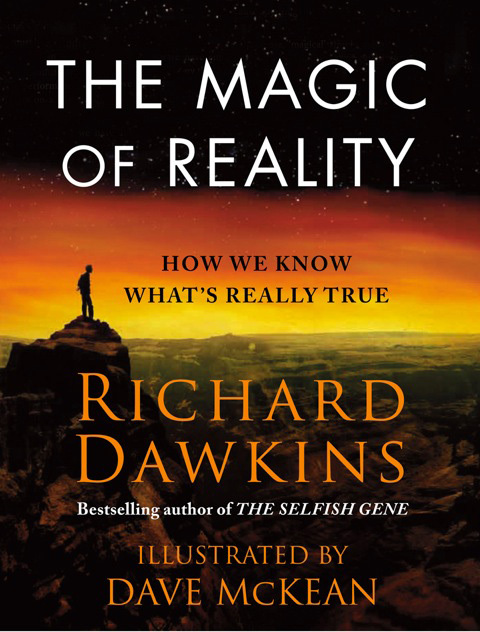 The book is called The Magic of Reality: How We Know What's Really True. As the father of 3 very curious young boys, I'm excited to get a hold of this book. It seems perfect for reading and discussing with children, and for keeping readily available for those times when kids ask questions about how things work. I've been disappointed with much of the books presently out there for kids about science, specifically those that address evolution (with the exception of Daniel Loxton's wonderful illustrated book, Evolution: How We and All Living Things Came to Be). Dawkins' book will be a welcome addition to our shelves. Magic takes many forms. Supernatural magic is what our ancestors used in order to explain the world before they developed the scientific method. The ancient Egyptians explained the night by suggesting the goddess Nut swallowed the sun. The Vikings believed a rainbow was the gods' bridge to earth. The Japanese used to explain earthquakes by conjuring a gigantic catfish that carried the world on its back—earthquakes occurred each time it flipped its tail. These are magical, extraordinary tales. But there is another kind of magic, and it lies in the exhilaration of discovering the real answers to these questions. It is the magic of reality—science. Richard Dawkins, the world's most famous evolutionary biologist and one of science education's most passionate advocates, has spent his career elucidating the wonders of science for adult readers. But now, in a dramatic departure, he has teamed up with acclaimed artist Dave McKean and used his unrivaled explanatory powers to share the magic of science with readers of all ages. This is a treasure trove for anyone who has ever wondered how the world works. Dawkins and McKean have created an illustrated guide to the secrets of our world—and the universe beyond—that will entertain and inform for years to come. On Tuesday, Dr. Keith Ablow, the oft-featured Fox News in-house psych, stated that parents should not let their kids watch Chaz Bono on 'Dancing With The Stars,' and claims that the show is "promoting transgenderism as if it were a civil right." 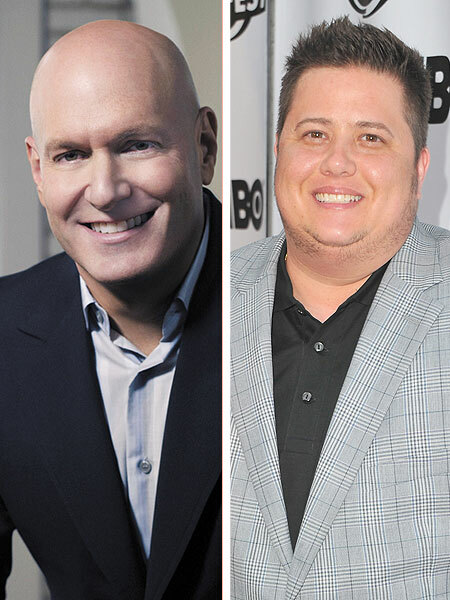 Dr. Blowhard is ratcheting up quite a track record of making inflammatory statements on gender and sexuality that are completely at odds with conclusions drawn by major scientific, medical, and professional organizations. If you recall, he ignited a firestorm for his statements on the J. Crew catalog which featured a mother painting her son's toenails pink. Based on the theatrical depiction presented below, Hell is a place that resembles a Vegas after-hours night club, where people dress like they're in a Pat Benatar video, and where God has no problem sending folks for having DSM-classified mental disorders. Bryan Fischer, Director of Issues Analysis at hate group American Family Association, has vomited up another vile tweet. Remember this one from a while back? We need to continue to call attention to his hateful rhetoric, and his close ties to GOP policymakers, until he is no longer welcome. Sadly, that time doesn't seem to be coming anytime soon. Yet another stellar entry in the Symphony of Science canon. This latest entry is described as "a musical investigation into the nature of atoms and subatomic particles, the jiggly things that make up everything we see. Featuring Morgan Freeman, Frank Close, Michio Kaku, Brian Cox, Richard Feynman, and Stephen Hawking." This is the eleventh video in the series. If you haven't spent any time with the others, you can view them all here.